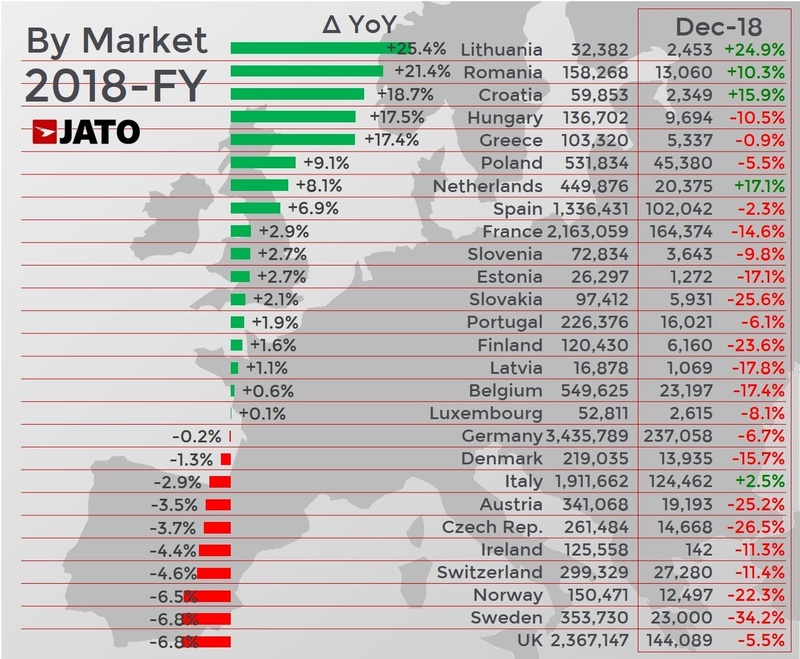 The European car market remained stable during 2018, as 15.6 million vehicles were registered – just 346 more than in 2017. It was the best result since 2007, when the market peaked with 16.02 million registrations. Strong results in Q2, where the market was up by 4.8%, and Q3, where the market was up by 1.1%, were enough to offset the large decline posted in Q4, where the market dropped by 7.5% and recorded its lowest volume since 2014. Diesel vehicles posted their lowest market share since 2001, as demand fell by double digits in 20 of the 27 markets included in JATO’s analysis, with the biggest drops in the UK (-30%), Scandinavia (-22%) and Benelux (-22%). “Throughout 2018 we continued to see the effects of the diesel crisis, as announcements of policy changes by governments led to confusion and panic among consumers,” continued Munoz. Globally, Europe was the world’s third largest car market behind China and the US, as strong results in Spain, Poland and the Netherlands were offset by falls in the UK, Italy and Sweden. Poland, Slovakia, Luxembourg and Lithuania all posted record levels of volume, while it was the best year since 2007 for Spain and Estonia, and the best year since 2008 for Romania, Hungary, Croatia and Latvia. In contrast, it was the worst year for registrations in Switzerland since 2010, the UK since 2013, and Norway since 2014. The majority of vehicles registered in 2018 were powered by gasoline engines, with the fuel type making up 57% of all registrations. This result marks a 7-point market share increase on 2017 and a 12-point increase in 10 years, confirming that gasoline vehicles continue to benefit from the demise of diesel. Diesel vehicles counted for just 36% of all registrations, as their market share dropped 8 points on 2017 and 19 points on 2011 – the peak year for the fuel type. Almost one million more consumers opted for a gasoline vehicle in 2018 than in 2017, while Alternative Fuelled Vehicles also benefitted with almost 200,000 more registrations than in 2017. 2018 marked the best ever performance for AFVs, recording 944,800 registrations and a 6.1% market share. This is a huge increase in ten years, having counted for just 0.5% of total registrations in 2008. Notably, most of the fuel type’s growth was driven by pure electric vehicles, which outsold plug-in hybrid vehicles, as their volume increased by 47% from 132,800 vehicles in 2017 to 195,300 vehicles in 2018. Norway was the biggest market for electric vehicles, where they held a 31% market share, while the Netherlands outsold the UK and became the fourth largest EV market, behind Germany and France. Despite growing at a slower rate than in previous years, the shift from traditional cars to SUVs continued in 2018. In total, 5.4 million SUVs were registered in Europe throughout the year, up 19% on 2017, as their market share increased from 29.2% to 34.6%. Demand for SUVs grew by 20% between 2016 and 2017, by 21% between 2015 and 2016, and by 24% between 2014 and 2015, and has more than doubled over the last four years. “Unlike other market trends that can often be short-lived, the SUV boom is stable and long-lasting. The success is down to the industry listening to consumers and giving them what they want in terms of design, subsegments and categories,” comments Munoz. Most of the SUV growth was driven by small SUVs, where volume was up by 29% to 2 million registrations, while compact SUVs continued to be the most popular type of SUV, with 2.3 million registrations – a volume increase of 17%. MPVs once again felt the impact of the SUV boom, as registrations fell by a huge 27% to just 891,000 – a result that marks the worst performance for the segment since the car became popular in the mid ‘90s. Midsize cars were also affected by the demand for SUVs, as both premium and mainstream types recorded double-digit falls. There was little change at the top of the car maker leader board, as VW Group maintained its position at the top, recording 3.72 million registrations and a stable market share at 23.8%, while PSA and Renault-Nissan once again came in second and third, respectively. 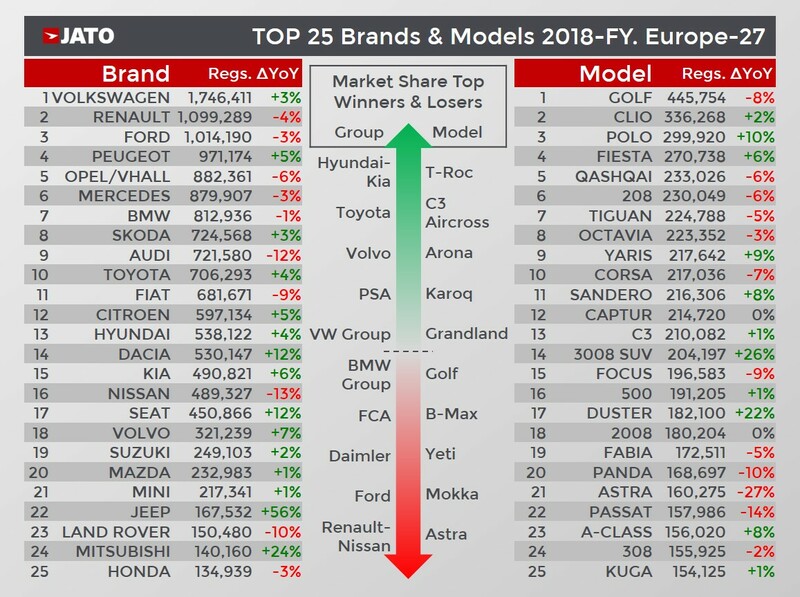 BMW Group climbed the rankings to become Europe’s fourth largest car maker, while Hyundai-Kia was the biggest market share winner, with its volume up by 5.2% to 1.03 million registrations, as it outsold other big makers like Ford (-3.3%), FCA (-2.4%) and Daimler (-2.8%). Among the brands, Jeep posted the highest market share gain and – for the first time in its European history – recorded a market share above 1%. Other market share winners included Dacia, Seat, Peugeot and Volkswagen. In contrast, Audi registered the biggest market share drop, followed by Nissan, Fiat, Opel/Vauxhall and Renault. The Volkswagen Golf was once again the best-selling car in Europe, however it did post an 8% fall in its registrations, mostly due to a big drop in its diesel sales, which were down by 30%. There was little change in the top 10 rankings, with the exception of the Toyota Yaris. Boosted by an increase in sales of its hybrid engine model, the Toyota Yaris was the 9th best-selling car in Europe in 2018, having ranked 15th in 2017. In contrast, the Opel/Vauxhall Astra left the top 10, as its registrations fell by 18% following large drops in its two main markets – the UK and Germany. Meanwhile, the Volkswagen Polo was the only model in the top 10 to record double-digit growth, while the Nissan Qashqai kept its place as the best-selling SUV in Europe, despite the strong growth posted by the Peugeot 3008, which came fourth. The Dacia Sandero narrowly missed out on a place in the top 10, falling just 730 registrations short, while the Duster was the second best-selling B-SUV, outselling other big players like the Peugeot 2008 and Opel/Vauxhall Mokka. Elsewhere, the Mercedes A-Class led the premium rankings, as the popularity of its new generation enabled it to dethrone the C-Class, and the BMW X1 was once again the most popular premium SUV.